Ben - Sensor networks can be deployed in a host of locations to shed some light on how systems change over time. Dr. Anne Verhoef from the University of Reading is using a very similar system to SNAQ Heathrow in order to better understand the relationship between plants, soil and the atmosphere. And Anne joins us now. So Anne, we've just heard about how we're hoping to learn about the environment of an airport. Well what are you hoping to learn with looking at soil and moisture and the atmosphere? Anne - We're actually still testing our wireless sensor network, but it will be installed in the Thames floodplain north of Oxford and this area is called Yarnton Meads. It's actually a site of special scientific interest, it's an ancient hay meadow. 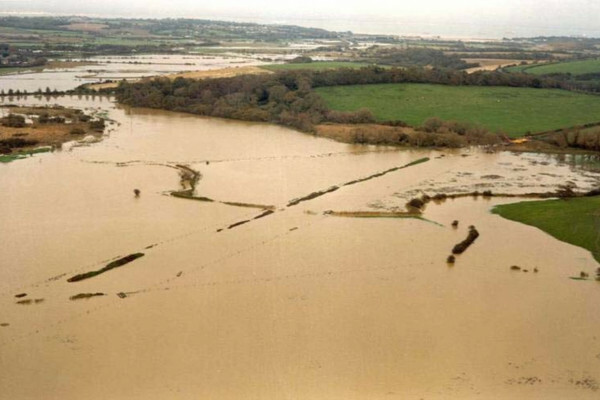 Research began in this area many decades ago because floodplains are a very valuable resource. Here, we have very rare plant species growing up to 40 species per square metre and also, these flood plains perform key ecosystem services such as flood storage and the retention of river sediments. So, it's very important that we improve our understanding of these very rare areas because there's actually only 1500 hectares left of this unique habitat in the UK. We're really aiming here to measure soil moisture and we're measuring soil temperature because what's happening in these flood plains is that the soil moisture content for example will vary spatially at a very high scale. So if we stand in one part of the field, if we take 10 steps, we could find an area that's much wetter. Here, we don't just have the river water over banking, we actually have the ground water rising and in certain areas where the microtopography is slightly different, we will have plants growing that have their roots in slightly wetter areas for example. So we don't have just the same species growing all over the field. We have areas where we have wet loving species and areas where we have species that like their roots slightly drier. Ben - You said that this has been an area of research for a while. Before we started developing sensor networks, how were we studying it? What tricks were we using? Anne - Yes, so people have been studying this area because there are some gravel pits at the north of this meads and people were worried that with the extraction of gravel that the groundwater would actually change, so they were worried it would drop and therefore that some species would actually disappear. So, various institutes and also botanists from the Open University started to look at this site and they, as we still do, would look at the species so we would quantify how many species we have. But also in the past, they would put one or two data loggers in this field and measure soil moisture. Maybe they would come back weekly and they still come back monthly for example to measure groundwater levels. But now, we want to measure this at a much wider spatial and temporal scale so that we can measure every half hour so that when we have a flood or when the groundwater does come up after a heavy rain storm, we're actually measuring it and we can see what's happening. Ben - Presumably, as it's an area of specific scientific interest, you can't just go around, dig a hole in which to put your sensor and then dig another 10 holes for another 10 sensors. You must be to adapt them to be a non-invasive as it where. Anne - Yes, so this is where the real special challenge is for our project, for what we call the FUSe project, Floodplain Underground Sensors. The key is really in the word 'underground'. We try to keep our sensors underground, obviously because we're measuring soil variables, but also, our nodes are little signal transmitters. We're trying to keep those, or we want to keep those, and we need to keep those underground, because we don't want visitors tripping over it. We also have cattle grazing here, during certain times of the year, and because this is a hay meadow there will be harvesting happening in the middle of summer, and we can't have the harvesting vehicles driving over our nodes. So we have the challenge that we need to get a signal from the sensors or from these nodes out to the soil. This is actually very hard because radio signals don't travel at all well through soil especially when the soil is wet, and when it has a lot of clay in it. So we've really chosen the most difficult site you could think of. It's a big challenge but we have some very good scientists from Imperial College who will be dealing with this problem with our help. Ben - I assume you can't just essentially turn up the gain, just make them more powerful in order to get that bit further? Anne - This is something we can do so, we're trying out different frequencies; they have all kinds of plans up their sleeves. One problem we obviously face is actually battery power because some of these sensors actually need some power before they can operate. So, if we want to keep those sensors underground for let's say, a year or two, this is a big challenge too to keep those batteries going. Ben - And once you start collecting the data, so once you get this regular update, this near real time input on a high resolution from these floodplains, what can you start to do with that data? Anne - Other than just looking at this data and studying how for example soil moisture content varies over the site, and we're hoping to have about 50 nodes placed over the field, we're also going to incorporate this data into an environmental model where we describe plant and soil processes through mathematical equations. But at the same time, we're going to pull in into that model high resolution Earth observation data so that we can not just work out what's happening at these 50 subsites over our field where we have our sensors, but actually, we can start upscale with these Earth observation data that may go down to about half a meter resolution, we can actually try to then make a map of what's happening to the vegetation, how healthy it is, whether it is water stressed or probably air stress that it's actually too wet. So we can really start to work that out from a combination of remote sensing data, model data, and this in-situ wireless sensor network data. Ben - And when do you expect you'll have all of your test done? When are you actually going to roll it out? Anne - Well, we have done some tests and we're going to do more tests in April. So hopefully, let's say the middle of summer, the end of summer, we will have some nodes in and we will be testing it. The project started for some us last April so it's now nearly 1 year in, but the Imperial College team actually started slightly later with some of their scientists working on this problem. So, I would say we have another 3 or 4 months before we have something happening. Ben - Well we look forward to getting you back on the show to tell us what you've been finding! Anne - Certainly, I'm looking forward to this. Do sounds add together to make louder sounds? What kind of hazardous residue results from a small house fire? Does philosophyethics play a role in the "GMO or synthetic biology revolution"? How can a skateboarder move without pushing anything? LIGO represents an mirror displacement of what? ©The Naked Scientists® 2000–2018 | The Naked Scientists® and Naked Science® are registered trademarks created by Dr Chris Smith. Information presented on this website is the opinion of the individual contributors and does not reflect the general views of the administrators, editors, moderators, sponsors, Cambridge University or the public at large.